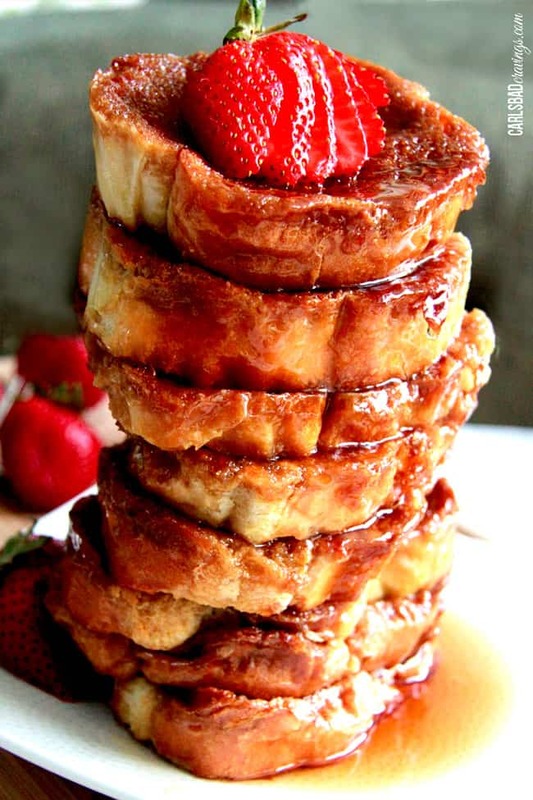 Creme Brulee French Toast tastes like glorious Creme Brulee and can be thrown together in 15 minutes and made the night before for stress free breakfast and entertaining! 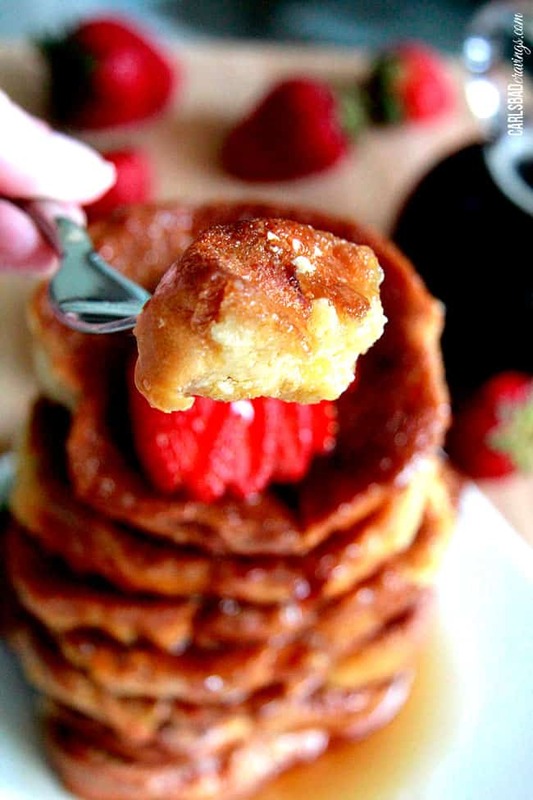 This Creme Brulee French Toast Recipe has a delicious golden caramelized toasted outside, is subtly creamy inside and seriously melt in your mouth delicious! I always make this Creme Brulee French Toast Casserole for special occasions like Christmas, Easter, birthdays, etc. because its always a hit and couldn’t be any easier! Do you like Creme Brulee? 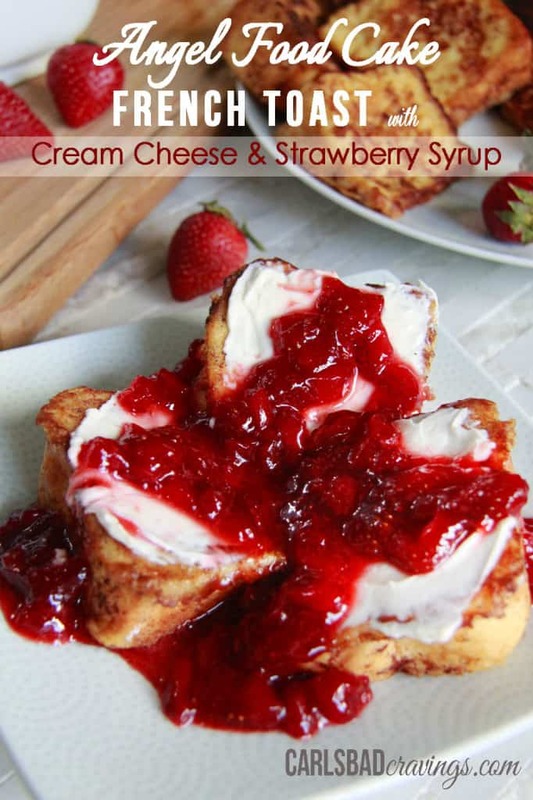 Now you can have Creme Brulee for breakfast, lunch, dinner and dessert with this ridiculously delectable Creme Brulee French Toast Recipe! Ill be the first to admit that I usually never make breakfasts like these for actual breakfast. I’m more of a breakfast for dinner type person. In the case of Creme Brulee French Toast Casserole though, I guess its more like dessert for dinner. So that’s dessert for breakfast for dinner. I’m confused. 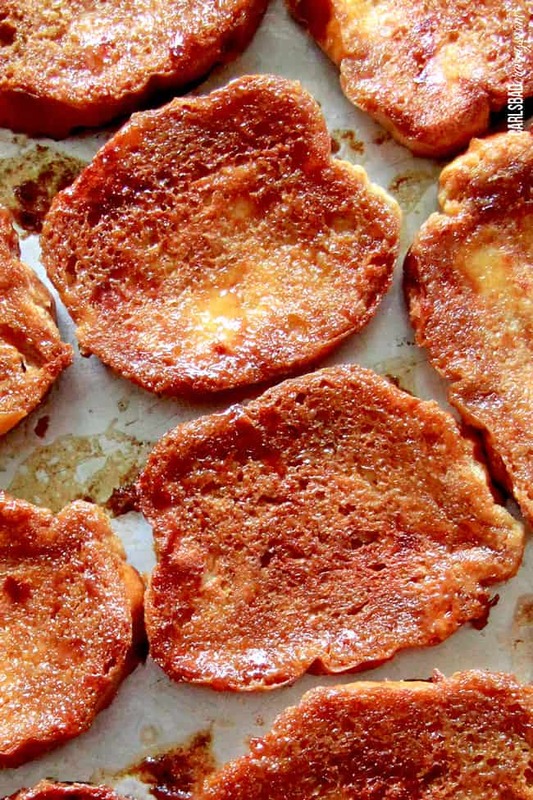 The point is, with this French Toast, you can get your Creme Brulee fix any time of day. And believe me, you are going to want this every time of the day! Ahhhh, Creme Brulee. Silky smooth vanilla custard with a thin crunchy carmalized sugar top. If its on a dessert menu, I don’t even look at the other options. I actually inhaled Creme Brulee last Saturday when we went out for my mom’s birthday. It felt like my birthday. 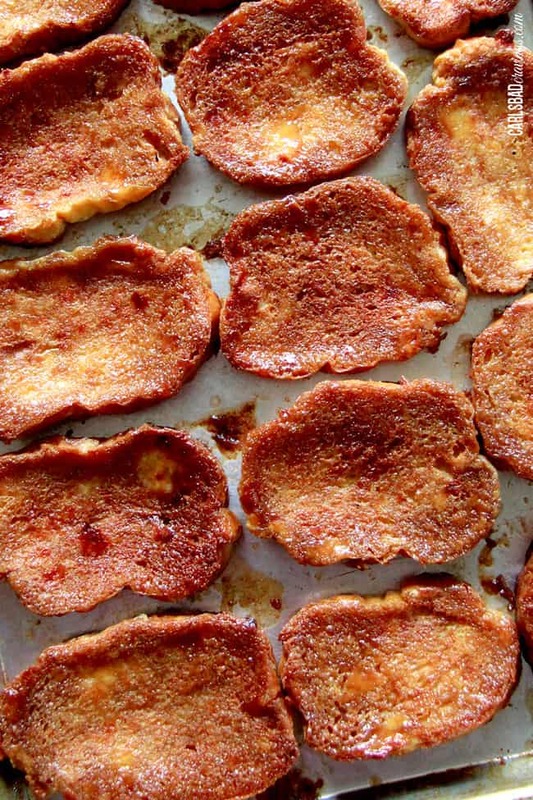 When I saw a Creme Brulee French Toast Recipe in an old church cookbook months ago, I was immediately intrigued, so naturally I googled it and found that it has been done many times before – but never quite like this. I made a few simple changes to the Six Sister’s Stuff version that resulted in OUT-OF-THIS-WORLD Creme Brulee French Toast. I eliminated the corn syrup, added maple syrup, added orange extract (to mimic the liquor flavor), flipped the toast after baking then broiled them to completely caramelize the top. When I actually shoved a mountainous forkful into my mouth, my eyes grew wide at how much it actually tasted like glorious Creme Brulee! 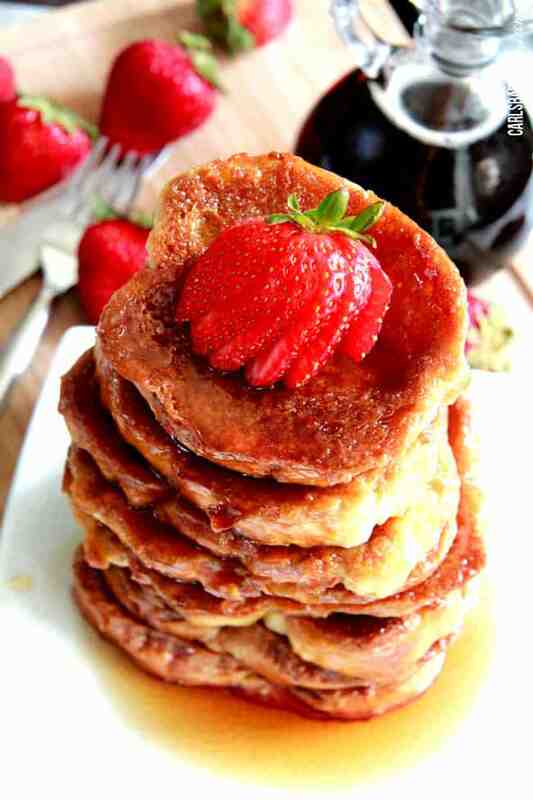 First off, making this French toast is SO EASY! Whip it up in 15 minutes, refrigerate, and then when you are ready to eat, pull your premade sheet out and bake. So fabulous for birthdays or special occasions like Christmas! Then you line the bread slices over top; then spoon a mixture of eggs, half and half, vanilla, maple syrup and orange extract on top of the bread. Simple and fast right? At this point you refrigerate the bread for 8 hours up to overnight. 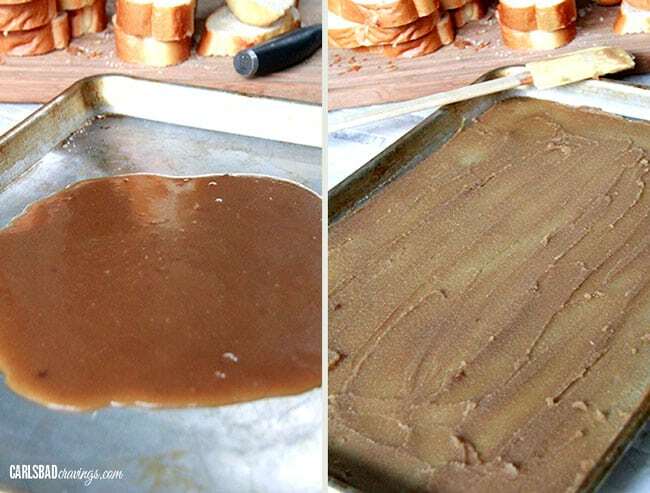 During that time, the bread slurps up all of the vanilla egg/half and half mixture like the picture below on the right. When you can’t stand the anticipation any longer, sprinkle the saturated bread with cinnamon then bake for 25 minutes then flip the bread over and broil until golden. You now have a French Toast that has soaked up all of the brown sugar/butter/cinnamon on the outside, eggs/half and half/vanilla/maple syrup/orange extract on the inside to create a golden caramelized toasted shell giving way to a subtly creamy custard-like filling. 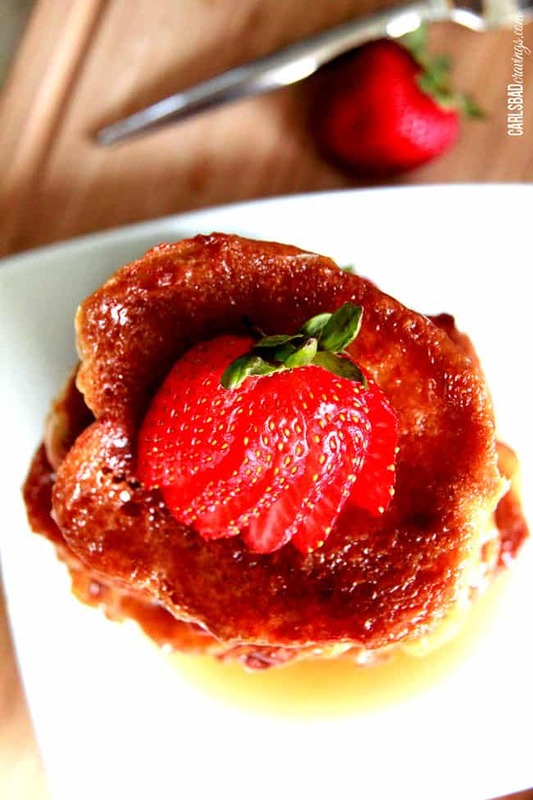 Want to try this Overnight Creme Brulee French Toast Recipe? 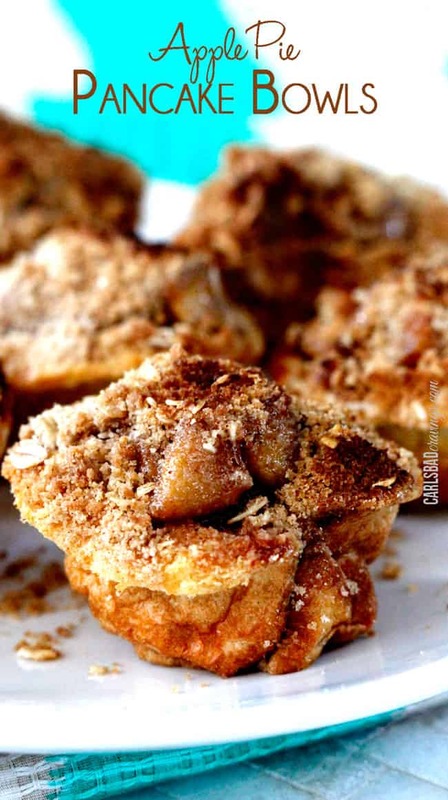 Pin it to your BREAKFAST, HOLIDAY or DESSERT Board to SAVE for later! Add eggs to a medium bowl and beat for 1 minute, then whisk in half and half, maple syrup, vanilla, orange extract and salt. 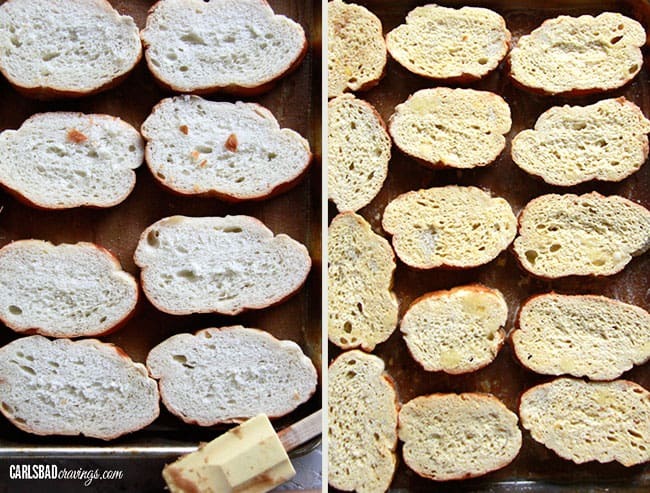 Pour or spoon mixture evenly over each piece of bread then lightly sprinkle bread with cinnamon. Cover, and refrigerate at least 8 hours, or overnight. Bake uncovered at 350 degrees (175 degrees C) for 25-30 minutes or until lightly golden then flip all the slices of bread over and broil until the tops are golden. Top with syrup, berries, whipped cream, etc. Good morning, Jen! I have been making this french toast recipe not only as a Christmas Morning tradition, but for family members’ birthdays and my Granddaughter’s sleepover parties! Always a hit and always delicious. Thank you for sharing! I love hearing that Lindsey, and what a fun Grandmother you are! I am so happy you are enjoying the recipe! Thank you so much! Best! Awesome Rose, I am so happy it was a “huge win” – yay! I hope you had a very Merry Christmas! I’ve made this twice now and both times AMAZING! I did use 2% milk instead of 1/2 and 1/2 and it turns out fantastic. I also didn’t have orange extract, but used cinnamon oil extract instead. 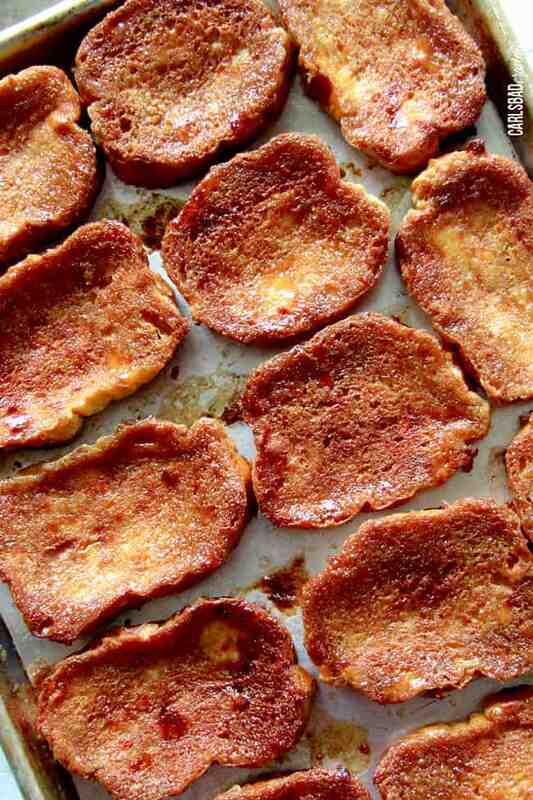 This blows any other french toast casserole out of the water. Really fantastic. My kids now request this for their birthday breakfasts. It really is special. Thanks for sharing! Hi Chavah, what an honor that your kids request this for their birthday breakfast! yay! I am thrilled you all love it so much! thank you!!! Wow. I love creme Brule and haven’t made a french toast casserole in a while. This recipe looks so yummy. I’m curious if there is a reason why you add the cinnamon before baking. I’m afraid I’d forget to do it the next morning (menopause brain). Do you think I could just add it to the custard mixture instead? Hi Lisa, you can definitely add the cinnamon to the custard mixture instead! 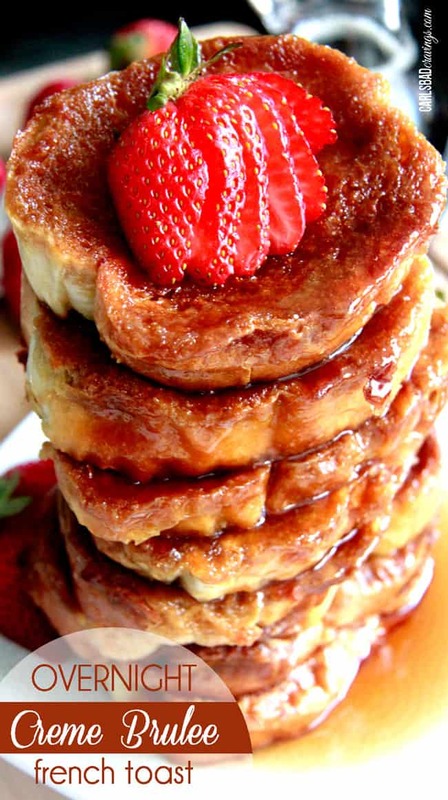 I am excited for you to make this French Toast – I think you will love it! I hope the creme brûlée you had was the white chocolate one from Bistro West. My family moved from the area last year and that is definitely something we miss! What?! That sounds amazing! I have not had that version but will be sure to remedy that ASAP! Thanks Andrea! Is there a reason why you don’t just dunk the bread in the custard and then place it on the pan? Would it be bad to do that instead of spooning it on? Hi Leslie, it is spooned on instead of dunked so the bottom of the bread is completely in touch with the melted butter/brown sugar mixture on the bottom of the pan and better bakes to resemble creme brulee. Hope this helps! I love creme brûlée and French toast so anxious to try this. 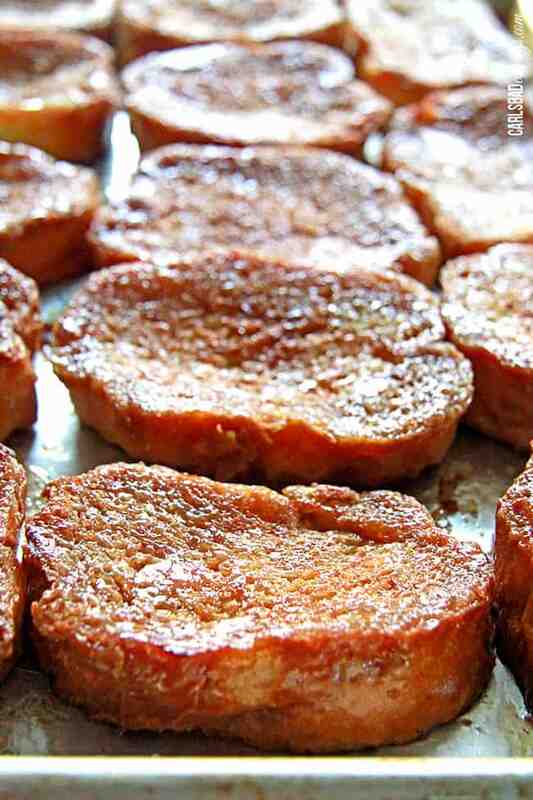 I usually make my French toast using Peppridge Farms sweet breads like cinnamon swirl or brown sugar and cinnamon. Do you think recipe would work with this kind of bread or does it need to be crustier like the French bread to work? Hi DJ, I am excited for you to try this too! I think this recipe could work with some sort of sweet bread but you would definitely need to dry the bread out first. I would bake the bread at 325 F for 20 minutes or so so it is almost crouton like consistency and then proceed with the recipe. Hope this helps! I made this for our Christmas morning breakfast, and my family loved it! It was such an easy thing to prepare the night before/morning of. I usually have to get up extra early to finish prepping rolls of some kind, but it was nice that I could just pop the pan in the oven, and just make syrup to go on top. The prep the night before was easy, too. (I did make a homemade loaf of French bread which I made previously, and had put in the freezer.) This is a delicious breakfast that requires minimal work. I was wondering how crispy your French toast is on top. In your pics, your toast looks nice and crispy, and although mine browned nicely under the broiler, it wasn’t crispy. I’m just wondering if it’s really not supposed to be crispy, or maybe I should broiler them even more. Thanks for a great recipe! Hi Kristin, my apologies for getting to your comment so late! I’m so happy this was a hit for Christmas with minimal work! 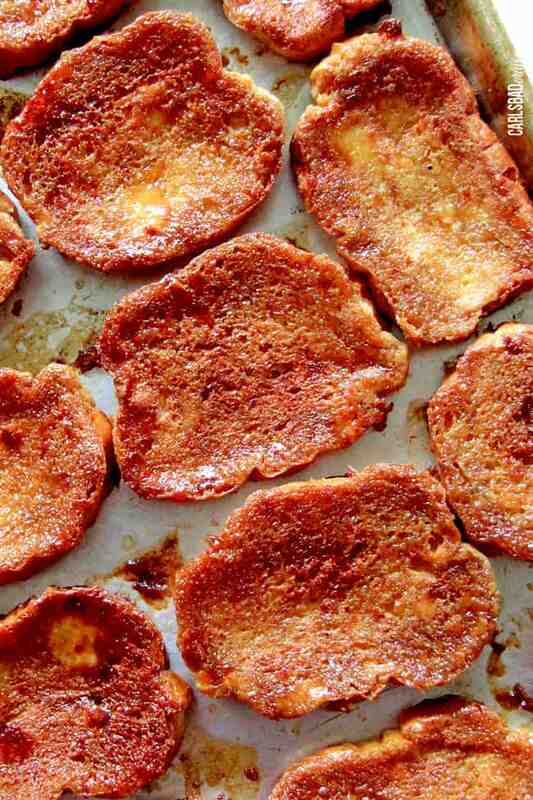 As far as the crispiness goes, they do get pretty crispy. Part of this is due to how long you broil it and part of it has to do with how dry your bread is to start with. If you do want it crispier, simply broil longer. I hope that helps! Thank you so much for your kind words Milly, that means so much to me! I am super curious how it turns out without soaking – please let me know!